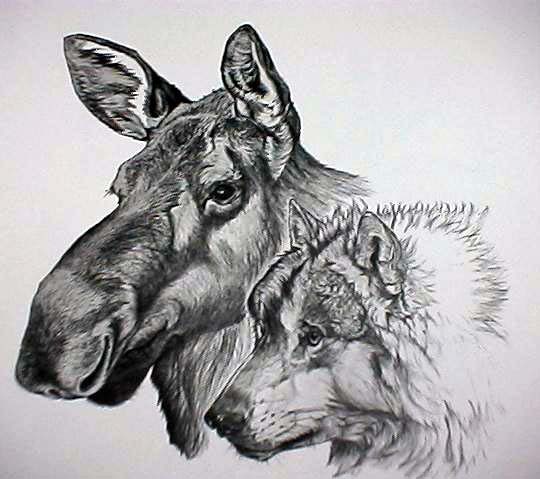 Beautiful wolf and moose drawings by a local trapper. John Majak is a soft-spoken ATA member from the Fairbanks area. Several years ago, our editor discovered John's artistic ability. 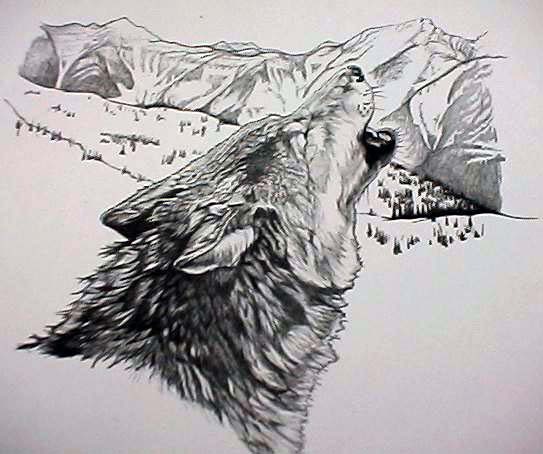 His work has subsequently appeared in both the ATA magazine and our Trappers Manual. John combines artistic precision with a "feel" for the animals and their habitat. John claims that he is "not really an artist. I just reproduce what I see." John's modesty is sincere, but we beg to differ with his evaluation. 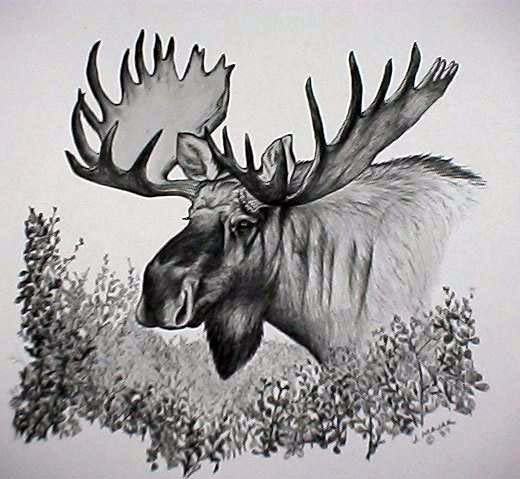 Those who have seen his work agree that John is one of the best wildlife artists they have ever seen. Now you can own prints of John's three most well-known works. These reproductions are printed on heavy stock and are suitable for framing. We have seen all three mounted side-by-side in a single frame. It was mighty impressive! If two or more prints are shipped together, then there is just one shipping rate. 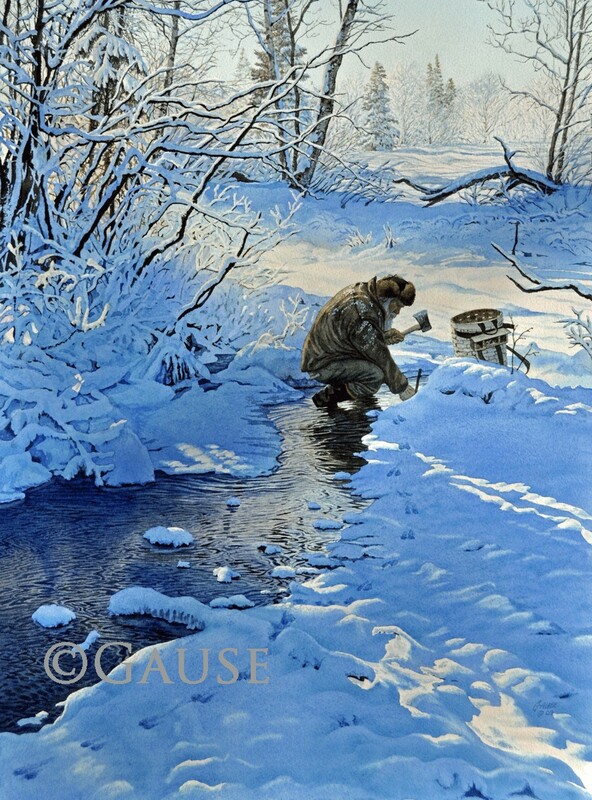 The Alaska Trappers Association is the fortunate benefactor of support from one of Alaska's most well-known wildlife artists. Sandy Jamieson is a man who wears more than one hat. He is a trapper, bush pilot and big game hunting guide. In these pursuits, he lives a lifestyle envied by many outdoorsmen. In addition, Sandy is an accomplished wildlife artist. He has a unique view of the relationship between humans and animals. His art typically incorporates a special twist which requires some thoughtful contemplation by the viewer. Learn more about Sandy's lifestyle and art on his web pagehttps://sandyjamieson.com. Mr. Jamieson generously donated an original painting to the Alaska Trappers Association for auction at our annual banquet. 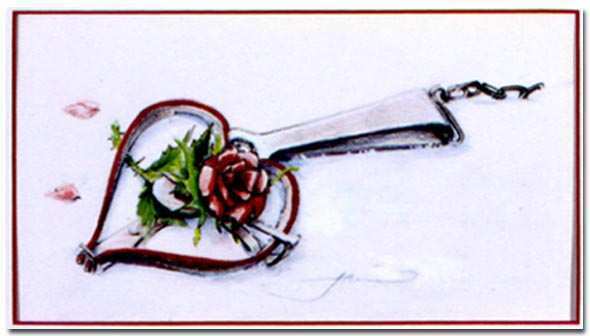 This unique painting depicts a foot-hold trap with red jaws in the shape of a heart. A red rose rests on the pan. The painting is entitled "Jaws of Love Life." The piece conveys different messages to different viewers. However, it obviously represents the relationship between men, women and trapping. The original painting was a very popular item during the oral auction at the 2001 ATA banquet. The pace of bidding was fast and furious. The winning bid was nearly double the price which Sandy had established prior to the auction. Obviously, trappers know great art when they see it! Mr. Jamieson has now graciously agreed to collaborate with ATA on the sale of limited edition prints of "Jaws of Love Life." ATA is confident that the prints will be just as popular with trappers (and their significant others) around the world as the original was here in Alaska. This print will enhance the décor of any home. It would be an ideal Christmas gift for your family or for a friend. Prints are available and can be ordered for $35.00 (plus shipping and handling) from ATA.